Tianlu (heavenly emolument) and Bixie (evil dispeller) are two Chinese mythological animals that herald in good fortune and keep evil at bay. Both look like a lion except for their wings the one with only one horn on his head is tianlu and the one with two horns is Bixie. During the Han Dynasty (206 B.C. -220 A.D.), the images of both animals were for ornamentation purposes. Sculptures of them were placed in front of tombs to suggest the dignity and power and authority the deceased enjoyed in their lifetime. As symbols of bravery and immunity to evil, the two animals are meant for those aspiring to ascend to heaven to ride on. 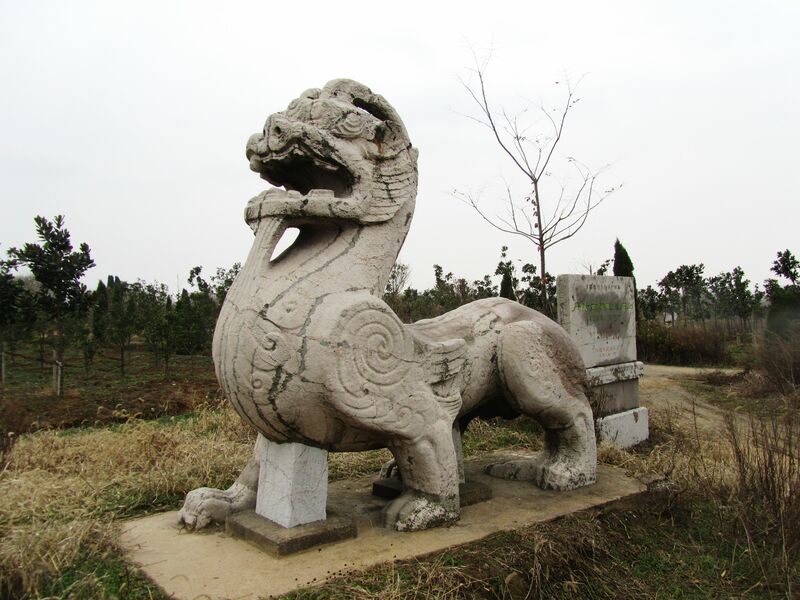 Images of tianlu and Bixie were inscribed, embroidered or carved on fabrics, army banners, bands and hooks, or the handles of seals and bells in ancient times. Tianlu and Bixie are cast in a pair of gigantic sculptures that stand along with stone pillars on the holy way that leads to tomb in the eastern suburbs of Nanjing.Buried in the tomb are the remains og XiaoHong,the younger brother of Emperor Wudi of the Liang dynasty.The sculpture of Bixie,3.8 metres tall,3.8 metres long and 1.55 metres wide,has a plump body and thick and short neck,its chest puffing and its belly protruding,and walking in giant strides with its tongue hanging out of its wide open mouth.This is by far the best-preserved large stone sculpture of Bixie.